i have come to realize that i am inspired mostly by movies, characters and the stories they tell. and a great percentage of these movies are fantasy based. i am unrealistic? ... yes. i live in a make-believe world? ... most probably. i am happy in there? ... most definitely! my latest movie experience was wolfman :) yes ... wolfman. if you are not into gory, shock treatments and body parts flying around, please do not go. i didn't know, so i went. but i braved through it, only closing my eyes during 2 parts ... but beyond that, i found mesmerizing beauty in the set locations which were purely english (yes lisa wright ... stop smirking;), the gorgeous pre-industrialization costuming, the hypnotic atmosphere and the stellar cast of sir anthony hopkins, emily blunt and above all, benicio del toro. i could have kicked myself for NOT knowing who benicio del toro is all these years, and even thought he was the harry potter director guillermo del toro ... and altho i wouldn't call "wolfman" his ultimate award winning piece (far from that actually) but it certainly made me curious enough to google "benicio del toro" ... and my ... what a treasure of an actor i found! but i couldn't stop thinking of the duality, the darkness, the forbidden, the curse and the conflict that is wolfman. and all my previous plans for this little baby ... seem to fade magically. yet ... there is an attraction that keeps me wanting to hold on to the purity and the good in this piece. and in my mind, i saw the face of gwen conliffe played by the ever beautiful emily blunt to perfection. and i realized that this might be the closest i have come in striking a balance between light and dark. i saw in this piece, a marriage between the characters of del toro and blunt, the duality that is in the man and the beast, the balance that could have been, between the pure and the untamed. i love the look of it and the effect it has on me ... it is something that i definitely would be exploring further. lately, i have also been thinking about "there and back again" . some of you who have known me for a while now, knows that i use to make costumes for my dance troupe. yes ... my (very infrequent) day job comes in the form of a choreographer and a stage director :p ... we were not big when we began so ... moi, had to make most of the costumes even if it involved a lot of glue-gunning and not so much sewing LOL!!! 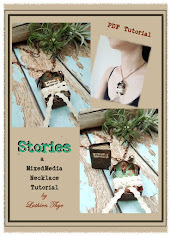 when i began making adornments just a little more than 6 months ago, i had in mind, selling. so i made things that were wearable. but lately, i feel that has changed a little. in that, i am reverting back to making adornments that look more like a "costume". i realize that these pieces probably won't sell, but they satisfy the psyche. so have i gone "there and back again"? it seems to me that i have made a full cycle. i did manage to find some pics of the costumes i made. the ones in white background must be at least 10 years old! GOSH!!! i'm old!!! ancient!! 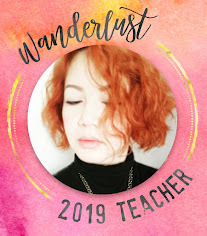 what a long post ... i hope i haven't bored you to tears already!! i shouldn't write anymore "contemplative" posts ... UGH!! I was not bored to read you fantasy post...I was amazed about you new necklace creation and also I love how do you wrihte about the balance between a light and dark!It SO good and I am absolutely agree with you mind!!! What a gorgeous work do you made with the costumes,really the last one with a big beautiful crone(light one)-is a magical! Thank you so,so much for you dearest,kind and warm comment by my!!! The costumes you made were absolutly incredible, stunning, amazing. I had no idea that you are a first class costume- deigner and taylor. And of cause I love your new elvish necklace. It is very special again. Bored???!!! This is fantastic, Luthien! I love reading your posts and watching your incredible creations! The costumes are stunning and the necklace is breathtaking, really! I LOOOOVE it, as everything you make! A real magic surrounds all your art! Oh yeah, he's a keeper! Love this post, and all the thoughts about balancing dark and light....I also LOVE your new piece and how assymetrical it is- wonderful! I understand completely your attraction to film.I finally realized that they too,if brilliant,can be works of art,and like art,they insprire the soul.Music does the same to me.Which is why I love to blast it while Im creating. Your necklace is truly amazing.There is so much detail.I had to take a while to sit and enjoy it.I was not aware of your background and have to say I am blown away by your costumes..Really Luthien,amazing work and a delightful treat at the end...Yummy!!Hugs-Cat. Girl you constantly amaze me! What can you not do? Enjoy the journey that your creative spirit takes you. THis piece is so beautiful! And you have not bored me. Love reading about you and what you do. Leather and lace...perfect. And I think very wearable. Just the perfect artsy one-of-a-kind piece, I would love to wear. Do what you love and the money will follow. Well - who'd have thought a big hairy bloke like that could inspire such a beautiful piece!! I love the tiny amounts of lace you've used, they compliment it beautifully, and I can definitely see the dramatic influences from your costume days. You're a natural storyteller with your art Luthien, and the good/evil, yin/yang, light/dark theme is endlessly fascinating! oooo ... hehehe ... he is indeed! thank you sweet fren :) i do cherish every creating moment i get ... it's become like food LOL!! 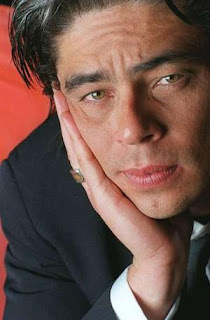 ooo, you like benicio del toro too? he's like a giant teddy bear ... i'm gonna try and find some of his older movies ... what i've seen on youtube ... he's an awesome actor. he one of those people who make you believe that he IS the character ... reminds me so much of viggo mortensen ... my inspiration! Oh wowwww, what a creative, inspiring mind you have. Those costumes are fantastic, out there and fabulous. If only I had one third of your creativeness! The piece is gorgeous. Love the costumes that you made too. Ancient!? If you're ancient, I hate to think what that makes me!!! Luthien, PLEASE don't stop writing these lovely contemplative posts!! They are so interesting and so much fun! I'm not a movie-goer, but your posts make me think I should be LOL! Your newest piece just shines and reflects your heart and soul! It's a perfect balance of light and dark. And costumes!!?! Another awesome talent you have! Those are gorgeous and look like they were professionally created! LOL!! i can't live without movies .. or visuals. and thank you so much for your very very sweet and supportive words :) as for the costumes ... don't even attempt to go near and look .... wahahahaha!!! LOL! i'm surprise they actually haven't fallen apart yet! I am blown away by your talent Luthien! Such an amazing eye for beautiful detail!!! wow how gorgeous is that...really a piece of art! I haven't seen those movies you've mentioned but one movie I did see that I just adored the Irish scenery and costumes in was Tristan & Isolde. I don't like watching movies much...I seem to find my source in nature and photography. Love your wording and your newest piece. It is inspiring!! Thanks also for coming to see me on my blog and the sweet comments. Love them. Hey Can I feature you Monday on my monday featured artist?? You just keep outdoing yourself. I love hearing about how you were inspired by films or songs. It gives so much more meaning to the piece. Your latest piece is STUNNING Luthien. Keep with it - PritiLisa is right!! You are soooo talented - your costumes are outstanding! !